Plantation, Windley, and Lignumvitae Keys: Plantation and Windley Keys (Figs. 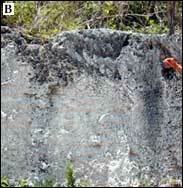 42B, 46B) have some of the highest elevations (~5.5 m above sea level) in the inhabited islands of the Florida Keys (Lidz and Shinn, 1991). Elevation of Lignumvitae Key is comparable, though the island is uninhabited. Lignumvitae Key has enough soil to support a dense hardwood forest that is fringed on its south side by mangroves (see Benthic Ecosystems for Tile 2). Windley Key is the site of an old limestone quarry. Though closed as an active quarry many years ago, quarrying activities left a valuable dry-land view inside the coral reef that built the middle and upper Keys about 125 ka (e.g., Hoffmeister et al., 1967). The coral reef is known as the Key Largo Limestone (Sanford, 1909). 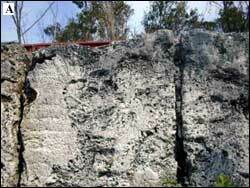 Because of its historic and scientific significance, the quarry was designated the Windley Key Fossil Reef Quarry State Geological Site in January 1999. The site now includes a museum that houses a pictorial history of the quarry and hands-on displays that explain the story of the ancient coral reef.